Intergalactic Airways is open for service and there are sixty-four different wacky Alienz now looking to return to their home planets! 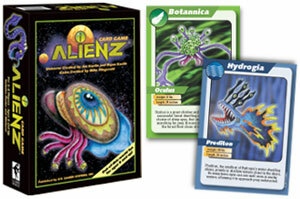 Collect these unique Alienz along with the coordinating planet cards, which serve as a one-way ticket home. The more Alienz you get on each flight and the more planets you visit throughout the game, the better your score.